This is on the moving true story of a blue-collar father and his teenage son, who became an undercover police informant and later a drug dealer, before he was abandoned by his handlers and sentenced to life in prison. 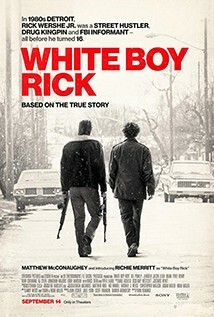 Set in 1980s Detroit at the height of the crack epidemic and the War on Drugs, Ricky Wershe Jr. (Richie Merritt) is a baby-faced rock-cocaine seller who dabbled in snitching and who successfully interloped in Detroit’s African-American urban decay. His father (the scene-stealing Matthew McConaughey) is a small-time gun-runner with a heart of gold, barely holding his family together with streetwise advice. Their entanglements with the law lead to informing, more dealing, and resolutions that do not seem fair. This is a vivid, darkly funny, punchy new feature from Yann Demange’s, his follow-up to his intense Belfast thriller ‘71’.